A Panic in Fat ! Please understand that this page pokes fun at the language and marketing techniques of the 1930's. The companies involved made thousands of corsets for thousands of women who benefited from their support. I have total admiration for the dedication of these companies to their clients. Note the following graphic lines:- " ..stout woman have been reduced to a state of quaking terror as their bulging waists, hips and unsightly fat ..." "...carries with it an early death penalty, high blood pressure ..." "...physical shipwreck..". Goodness, it is hard not to panic.. But read on. If one embraces the fashionable "..toothpick type.." one becomes prey to another litany of ailments such as "Tuberculosis, nerves, weakness ... indigestion and organic disease." Even the thinnest are by now panicking! The solution, as I'm sure you have guessed is to phone your Spirella consultant immediately and get fitted for a Spirella corset. To be fair, the article does promote the concept of healthy living, however, it suggests subtly that such a feat is beyond most women. Possibly it is. How times have NOT changed. this was written 75 years ago and is in many respects relevant today. It gets off to positive start, if you weight 250 pounds (112 kg) that is! But read on "..those great layers of fat that bulge over the abdomen and roll down in waves .." "..saggy stomach and flabby, overhanging abdominal wall". With a doctorate in engineering one might fathom how to adjust the three full length lacers, the convenience lacer, the double asymmetric sacro-strapping and the frightening "Under Pressure Belt"; well it would be wouldn't it ? One had to fasten the device properly or one began to experience that "..smothered feeling from undue pressure on the heart." 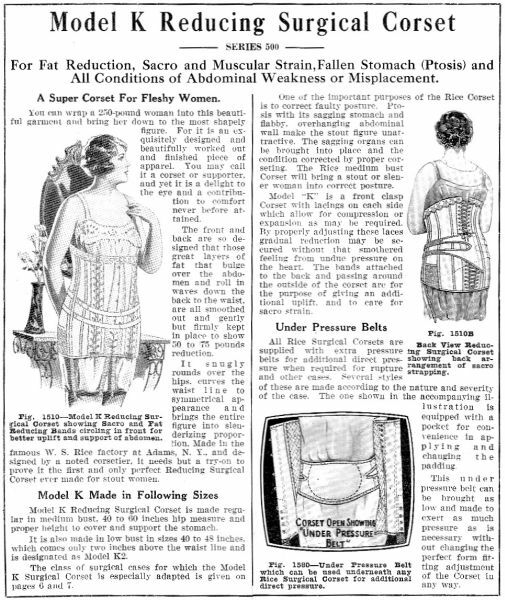 Mind you, if the corset, as it is claimed, reduced you from 250 pounds to the appearance of 175 pounds, something somewhere is going to get squashed. No advice for a healthy lifestyle from Rice. Once you were at this stage of, what did Spirella call it, "physical shipwreck," expensive corsetry of alarming complexity would be the only solution. 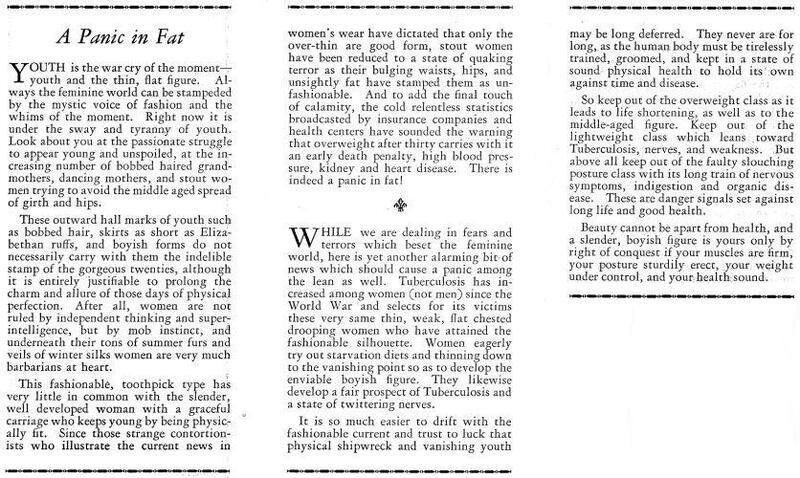 Amazingly, they too attack the thin woman and provide equal complexities to ward off ill-health. Regard the incredible extremes to which the brassiere can be taken (right). "..to confine the breast stomach and abdomen." "..there is no way for the flesh to escape." Oh dear, that sounds like undue pressure on the heart again! Mind you "Light mesh extends .. makes it cool for summer wear" at least should help alleviate the scarlet complexion of the victim and get that blood pressure down. Fortunately, Rice avoided making his corsets out of latex but not all manufacturers were that wise!